Have you ever met a Shrinebeast? PROVIDENCE — Is it possible to have too many flowers? Too much beauty? Too much love? Andrew Paul Woolbright’s rococo paintings at Yellow Peril Gallery rejoice in sensuality, even as they question excess. They revolve around mythical figures he calls Shrinebeasts, inspired by the optimism the artist discovered when he first met his wife. The pair, enveloped in voluptuous blossoms, in some ways represents a force of love and hope. But they also give the artist a means to examine the challenges of bonding and the underbelly of desire. The world the Shrinebeasts encounter isn’t simple, and the characters have an edge. The male looks flayed. In “Pearl Vom,” he’s immersed in flora — amber fronds, teal greenery, plump roses — and he vomits pearls. Look at the pearls as the effluvia of anything addictive and not sustaining: sugar, alcohol, social media. The show’s title, “Here, where the tweets turn into pearls,” might refer to our tweeter-in-chief, a paragon of immoderation. Woolbright effusively employs overheated tones, thick impastos, glossy mists of spray paint, and discrete pieces of paint affixed to the surface. The over-the-top process dovetails with his thematic exorbitance. He could take it even further. 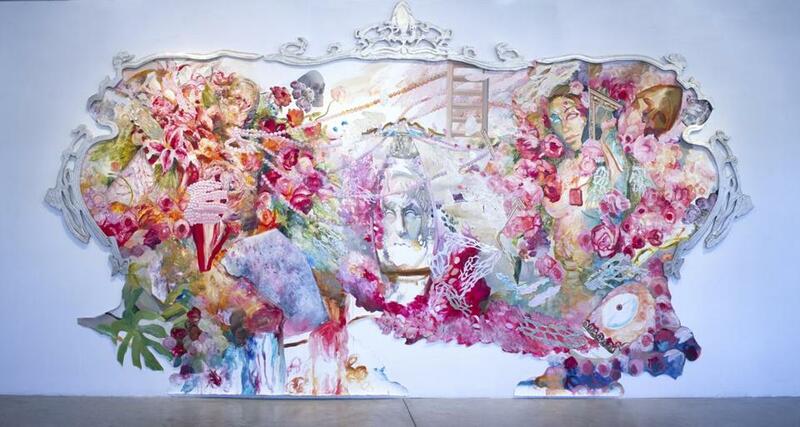 The show’s centerpiece, “Baroque Brut,” an ornately shaped, big canvas, overflows with flowers. The man, wearing a pearl glove, has a meteor in his lap — a star has fallen. A lava lamp with a picture of the Greek philosopher Epicurus, proponent of happiness, glows at the center. The head of a Cyclops, with one huge eye and the metal dental jewelry hip-hop artists wear, sits at the woman’s feet. The lavishness may register as plenty, but with plenty comes the dicey and sometimes divisive matter of desire. A skull looks over the scene, recalling 16th-century Dutch vanitas paintings — still lifes abundant with ripe and overripe fruit, picked-over meals, and skulls. It doesn’t last, those paintings counseled. It rots. Be wary.